The King's Speech; Also, Is Rahm-bo A No Go In Chicago? : It's All Politics In Political Junkie: Previewing Obama's State of the Union address, a new wrinkle in Rahm Emanuel's plan to be the next mayor of Chicago. Plus: winners are named in the 2010 election contest! Previewing tonight's State of the Union message. Rahm Emanuel's ballot status in Chicago. Announcing the winner of the 2010 Political Junkie election contest, and the ScuttleButton winner as well. A list of comebacking senators. This day in campaign history: Shirley Chisholm declares for president. In this poll-driven (and poll-obsessed) country, one thing is clear in advance of tonight's State of the Union message: President Obama's job approval numbers are improving. It's more than simply saying they have broken the 50 percent threshold; there's a sense out there that Obama has righted his ship that was teetering the past year and a half. Credit it to the accomplishments of last year's lame-duck congressional session, where the president took a leading role in a give-and-take with Republicans. Credit it to his impassioned speech at the memorial service in the wake of the tragedy in Tucson. But credit it also to the fluctuations — or the fickleness — of the American electorate. Once upon a time, one party could control Congress for decades; witness Democratic majorities in the House for 40 years (1955-94). Not so anymore. Big Republican wins in 2002. Democratic takeover in 2006, with further gains in 2008. Republican tsunami in 2010. Change, a word not often heard in Washington, is now constant. You don't come through, you're gone. And so, Obama, whose numbers began to steadily decline starting in the summer of 2009, seems to have rebounded. The momentum could be fleeting, but, right now, he has it. The comparisons to President Clinton's political resurrection are obvious. Clinton, whose party got drubbed in the 1994 midterms, found himself musing about his relevancy in the spring of '95. But then came the terrorist bombing in Oklahoma City and Clinton's eloquent response. His speech gave him a huge boost in approval ratings, and the subsequent overreach of the congressional GOP — most notably, House Speaker Newt Gingrich's role in shutting down the government — began Clinton's trail to an easy re-election victory in '96. Current Speaker John Boehner is no doubt aware of the lessons of '95-96 and is not about to repeat Gingrich's mistakes or excesses. But others in his party may be less cautious. While Rep. Paul Ryan (R-Wis.), the chairman of the House Budget Committee, is giving the official response to the SOTU, Tea Party favorite Michele Bachmann (R-Minn.) is giving her own rebuttal. Now, it is not unusual for others in the opposition party offering their take on the state of the union, but the Tea Party Express is actively touting Bachmann's speech, and CNN is planning on carrying her speech live. Not everyone in the Republican Party is thrilled with Bachmann's move. Few specifics are expected in Obama's remarks. There will be talk about spending priorities. About creating jobs. Reducing the deficit. I suspect an effort to restate his case for the health care bill, since repealed by the Republican-controlled House. And while everyone agrees that an argument for gun control may not be the answer, there could be an effort to further limit the access to firearms to those who have exhibited mental disorders. But tonight is mostly about tone. The tragic irony of Tucson is that in the aftermath of the shootings, the rhetoric and finger-pointing increased. Since the early vitriol, much effort has been made on lowering voices. Some Democrats and Republicans are actually planning on sitting together during the speech; no Joe Wilson outbursts this time. That comity may last as long as Obama's speech. 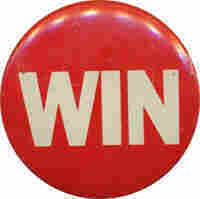 It may be as effective in toning down the anger as President Ford's 1975 WIN buttons were in whipping inflation (now). Chicago Stunner. Rahm Emanuel's path to the mayoralty of Chicago suffered a huge, and unexpected, bump yesterday, as a panel of Appellate Court justices, in a 2-to-1 ruling, said the former congressman could not appear on the ballot because he was not, as the law requires, a resident of the city for a full year before the election. Emanuel has been the odds-on favorite to win the job that Richard M. Daley is giving up after a record 21 years. He has, by far, the largest campaign kitty and a huge lead in the polls. Earlier objections to his candidacy by people who said he was not a resident for the required period of time were dismissed by the Chicago board of election commissioners and a Cook County judge. Monday's ruling by the appellate panel was a bombshell. The election is Feb. 22 — just 28 days from now. It has given new hope to his main opponents, led by former U.S. Sen. Carol Moseley Braun. A recent Chicago Tribune poll had Emanuel with 44 percent of the vote, followed by Braun with 21 percent. Trailing were former Chicago Board of Education president Gery Chico (16%) and City Clerk Miguel del Valle (7%). The black vote was evenly split between Braun, the first and only African-American woman ever elected to the Senate, and Emanuel. If no candidate received a majority, the top two finishers would advance to a runoff on April 5. Emanuel has argued that his residence in Washington, where he lived while serving as President Obama's chief of staff, was always intended to be temporary, and that he kept his Chicago home, voted from Chicago, and paid Chicago taxes. He has appealed the decision to the state supreme court, which is expected to rule as soon as this week. Early voting begins next Monday. My guess is that the supreme court reinstates Emanuel to the ballot. Courts have in the past shown some leniency when it comes to placing candidates on the ballot, despite the law. Think back to New Jersey in 2002, when an ethically-challenged Sen. Robert Torricelli (D) quit his bid for re-election. Democrats replaced him on the ballot with former Sen. Frank Lautenberg, even though the replacement came well after the deadline as stipulated by state law. Republicans cried foul and took their case to court. But the justices allowed it to happen. But as of now, wow. UPDATE (1 p.m. Tuesday): The state Supreme Court halted the Chicago board of elections from printing any ballots without Emanuel's name on them. From the Archives: "Rahm Could Face a Crowded Field" (Political Junkie, Sept. 9, 2010); "Daley Won't Run Again" (Sept. 7, 2010); "Chicago's Long-Running Daley Show" (Feb. 21, 2007). Sargent Shriver Reax. A nice piece on Shriver, who died last week, in the Jan. 22 Washington Post, by former local TV reporter Patrick McGrath, about what might have had happened if the former Peace Corps director ran for governor of Maryland in 1970, as he intended to do. Mary Martin of Baltimore writes that Shriver was a "good and caring man" who would have "made a great governor, or senator, or vice president, or president. The nation could have used Sargent Shriver in public office." Joan Lawrence of Washington, D.C., writes that Shriver was the "one Kennedy I could have voted for." But not everyone came away with great memories. Paul Mulshine, columnist for the Newark Star Ledger, writes that Shriver "was the first big-time politician I ever saw in person. When I was at Rutgers in 1972, he was running for vice president on the Democratic ticket, Shriver made an appearance in Edison and I went to see him. Here's what I recall: Nothing. I'm sure he was a nice guy, but he didn't have a knack for connecting with a crowd." A: It's not that uncommon. Kent Conrad (D-N.D.), for example, was elected in 1986 with the pledge that he would not seek re-election unless the federal budget deficit was reduced during his term in office. It was not and so he kept his word. However, a couple of months before his term was to come to an end, the state's other senator, Quentin Burdick (D), died. Conrad then won a special election that year to fill Burdick's seat. In the course of the same day, Conrad resigned one Senate seat and assumed the other. That was a bit unusual. Another odd example: William Purtell, a Connecticut Republican, was in the middle of running against Sen. Bill Benton (D) in 1952 when the other senator, Brien McMahon (D), died in August. Gov. John Davis Lodge (R) appointed Purtell to fill the McMahon seat until the November special election could be held, which was won by Prescott Bush (R) over Abe Ribicoff (D). 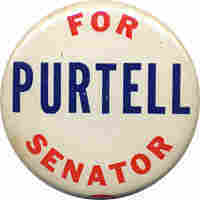 Purtell, meanwhile, defeated Sen. Benton for the other Senate seat. And here's one more, which was alluded to in Jim Coughlin's question (see above). Frank Lautenberg, a New Jersey Democrat, was first elected in 1982 and retired in 2000 after three terms. Two years later, ethics problems forced fellow Democratic Sen. Robert Torricelli out of a re-election bid in October, and Democrats persuaded Lautenberg to run once again. • Howard Metzenbaum (D-Ohio) was appointed to a seat in 1974 but promptly lost his bid for the nomination in that year's primary to John Glenn; Metzenbaum then unseated Sen. Robert Taft Jr. (R) for the other seat in 1976. • Hubert Humphrey (D-Minn.) served from 1949 until his resignation in 1964 following his election as vice president. He was succeeded by Walter Mondale. Two years after Humphrey's defeat for the presidency in 1968, he came back and won an open seat and served until his death in 1978. • Barry Goldwater (R-Ariz.) served from 1953 until he gave up his seat in 1964 to seek the presidency. He was succeeded by Paul Fannin. Goldwater came back to win an open seat in 1968. • Chapman Revercomb (R-W.Va.) was elected in 1942 and unseated in a rematch six years later. He then won a 1956 special election for the other seat but lost that one two years later to Robert Byrd (D). • Joseph O'Mahoney (D-Wyo.) served from 1934 until his defeat in 1952. He then won a special election for the other seat in 1954 and served one term. • Alben Barkley (D-Ky.) served from 1927 until he was elected Veep in 1948. After he left the vice presidency, Barkley defeated Sen. John Sherman Cooper (R) in 1954. • Henry Cabot Lodge Jr. (R-Mass.) served from 1937 until he resigned in 1944 to join the Army, the first person since the Civil War to leave the Senate to go to battle. Once out of the service, he unseated a Democratic senator in 1946 but lost the seat six years later to John F. Kennedy. • Guy Gillette (D-Iowa) served from 1936 until his defeat in 1944. He then won the other seat in 1948, only to be unseated once more in 1954. 2010 Pool Winner: At long last, here are the results of my Official 2010 Election Contest, in which you were asked to predict winners in a dozen races, in addition to coming up with a breakdown of the next House and Senate. As it turned out, eight people tied for first place, with 92 percent correct answers. The eight: Jamie Doherty of Torrington, Conn.; Daniel Oates-Kuhn of New Paltz, N.Y.; Chester Morrison of Panama City, Fla.; Elvis Fuentes of Guttenberg, N.J.; Roger Debreceny of Aiea, Haw. ; Rob Harol; Dan Groth of Boulder, Colo.; and Nicole Zimmerman of Clarksville, Md. In addition, Mike McGee of Novi, Mich.; David Rosman of Columbia, Mo. ; "Owen;" Ken Saggese; and Peter Davis of Champaign, Ill. all predicted the GOP would end up with 242 House seats, which they did indeed. In the two races with winning independent candidates (Lisa Murkowski in Alaska and Lincoln Chafee in Rhode Island), 60% predicted correctly that Chafee would win in as compared to only 41% predicting the outcome in Alaska. The highest percentage of correct predictions were for the Senate race in Washington, with 76% correctly predicting Patty Murray. The second "easiest" call came in West Virginia, where 67% predicted Joe Manchin would win. The lowest percentage correct was the aforementioned result in Alaska. That was followed by only 45% predicting Pat Quinn as the winner in the Illinois gubernatorial contest. The results were almost split in predictions for the Senate in Illinois, which went Republican. Just 51% correctly identified Mark Kirk as the winner. Rome for Mayor — Bernard Rome, the former head of the Offtrack Betting Corp. who was ousted by Mayor Ed Koch in 1979, announced as a Republican candidate to oppose Koch in the 1981 election. Curtis for Me. — Ken Curtis, a Democrat, was re-elected governor of Maine in 1970. Dave Owen for Governor — He finished second in the Republican primary in Kansas in 1982. Jewish star with a teardrop — I'm not exactly sure what this button refers to, possibly in response to a terrorist attack in Israel. Me for Lee — Former Syracuse Mayor Lee Alexander unsuccessfully sought the Democratic nomination for the Senate from New York in 1974. Viva Ed Koch Nuestro Alcalde! — A Spanish-language button for NYC Mayor Koch's 1981 re-election bid. Romeo and Juliet. Those wacky star-crossed lovebirds, as per William Shakespeare. This week's winner, chosen completely at random, is (drum roll) ... Lindsey Arthur of Weatherford, Texas. This Day In Campaign History: Rep. Shirley Chisholm (D-N.Y.), the first African-American woman ever elected to Congress, declares her candidacy for president. 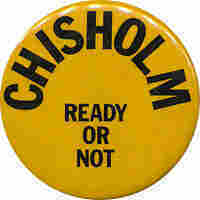 Chisholm, from Brooklyn, says in her announcement, "I am not the candidate of black America, although I am black and proud. I am not the candidate of the women's movement of this country, although I am a woman and I am equally proud of that." She was never a factor in any of the primaries but she stayed in the race through the convention, where she won more than one hundred delegates (Jan. 25, 1972).